Published on October 14, 2013 June 22, 2014 by Kristina @ Family. Work. Life. 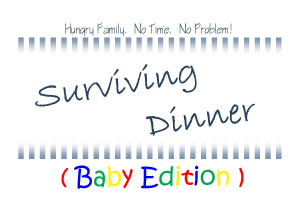 “Surviving Dinner” is a series that is not about good wifeing, mothering, or cooking. It’s about surviving. It’s for those nights when you’re tempted to write “fast food” on the menu, but cooking at home will save you a few dollars, a few hundred calories, and loads of mommy-guilt. And now that baby is eating with the rest of you, you need a strategy! Feeding them foods you’re already cooking for everyone else or having some pre-prepared purees in your freezer will help you save money on baby food, ensure the freshest ingredients and best flavor, and let you focus on cooking dinner for the rest of the family. I mentioned before that I prefer to give as little money as possible to baby food companies. I’m not anti-baby-food per se, but more like anti-pay-more-money-for-something-I-could-just-as-easily-do-myself. Commercial baby food is certainly convenient – especially since it’s shelf-stable – and occasionally we use it. However, most of the time I’m able to find something else around the kitchen for Brynna thanks to a number of easy no- or low-prep foods suitable for baby that I keep as staples in the house these days. Banana – Peel, mash, and serve. Add water if you need to thin it. Doesn’t save well since it browns. Avocado – Same as above. Applesauce – Organic no-sugar-added applesauce is pretty much the same thing as baby food, except the giant jar is equivalent to 12 of those little 4-oz jars. Even buying a large container of name-brand organic applesauce is 33% cheaper than buying 12 of the traditional non-organic baby food jars. Yogurt (only for older babies) – I buy organic plain (unsweetened) yogurt and combine it with a fruit to sweeten it. I have no idea how much “baby yogurt” costs and I don’t care to know. 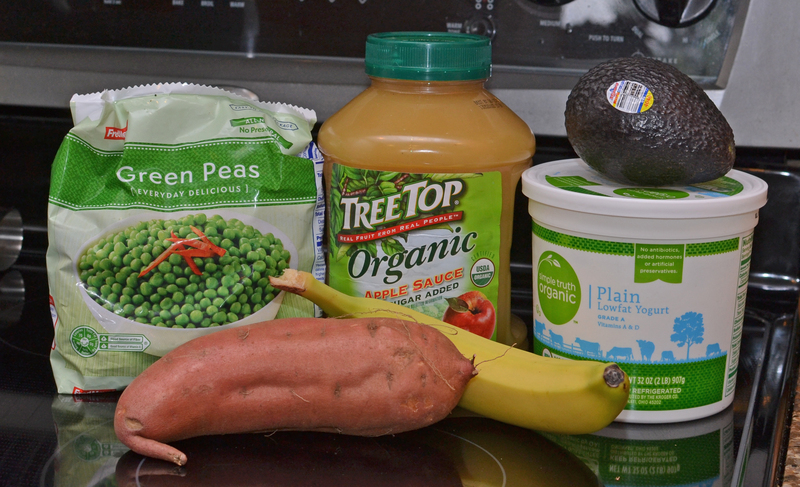 Sweet potato – Pierce it, stick it in the microwave for around 8 minutes, mash, and serve. Add water if you need to thin the mash. Frozen peas – At $1 a package, you can’t beat the price. It’s more than 75% cheaper than “real” baby food! Cook them in the microwave according to package directions then dump the peas and water into a food processor or blender to puree. Next week I’ll name a few of my favorite mix-ins to add to baby’s meals that take a little more prep work. See you then!